Actually, I have been legal for a long, long time! As of September 1st of this year I can legally sell honey at Farmers Markets as long as I meet the State of Texas’ labeling requirements. 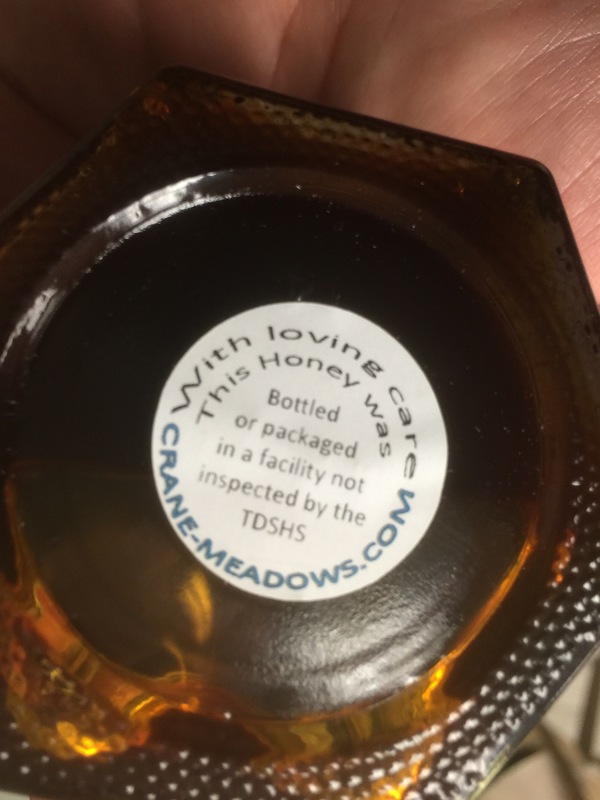 The key change for small producers, those selling under 2,500 pounds per year, requires a label indicating that the honey was not bottled in a facility inspected by the Texas Department of State Health Services. This is an example label added to the bottom of a jar. I snapped this iPhone photo at the Liberty County Beekeepers meeting this week. This little law change has many small producers breathing easier. To sell retail or wholesale, honey must be bottled in a licensed and inspected honey house/facility. That cost is beyond the means of hobby producers. Many small producers were technically breaking the law prior to September 1st. Small producers could always sell direct to the customer. A caveat, the honey must have been sold by the producer or immediate family member. That was how is I peddled my honey. My haul from the northern hive was small but very tasty. 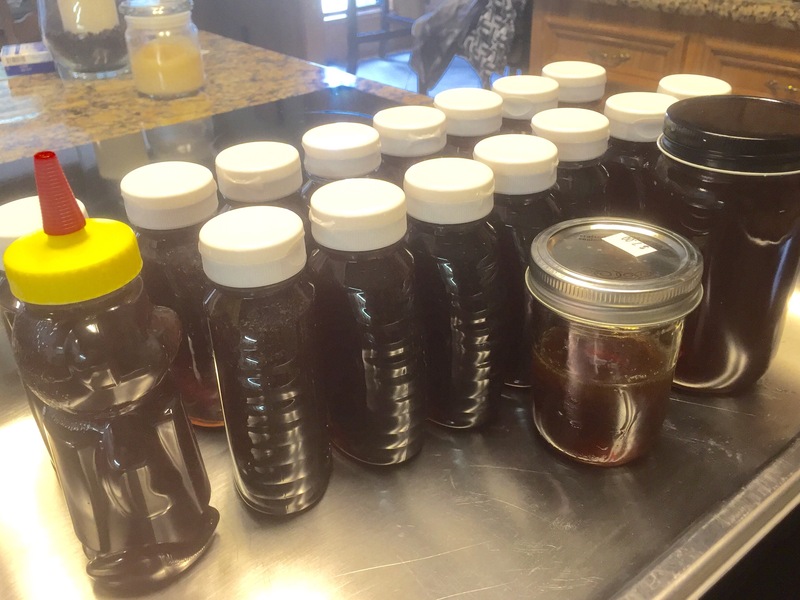 Most of the honey was bottled in 3/4 pound plastic Queenline bottles. I made a little larger bottle as payment to the hive’s host. About 13.5 pounds total for this trip. The hive is now in winter mode and the honey remaining is for the bees. I just love the feel of the bottle getting heavy as it fills, the wonderful aroma that escapes and catching the sweet drops on my finger as the valve closes. I do lick my fingers and then rewash before proceeding! Yes I do! The honey bear actually holds the same weight as the white topped bottles. I have the catalogs out, dreaming about next spring and deciding how big my hobby will become. At a minimum I will have my existing Langstroth and two top bar hives. Let me amend that, I am building two “half” top bar hives this weekend. I can use them as Nucs or if arrangements can be made, as a rescue hive for cutouts or for capturing swarms. Wish you all the best, I know your buyers will appreciate local honey. 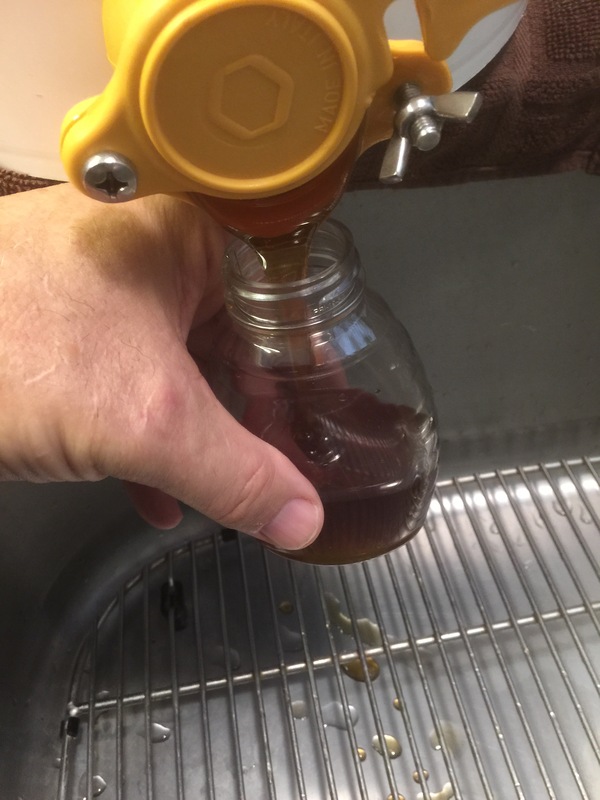 Thanks, most folks seem to be amazed at how flavorful raw, unfiltered honey can be. I love the sweet floral aroma that permeates the air when I extract!